Gus looks at Max's credit card. Jack asking Lyn ‘What about my confidence'. Max and the cable TV man. Max says goodbye to the locksmith who has just changed all locks and left keys for front and back. He puts some in an envelope, marks it ‘Steph's keys' and leaves it on a shelf near the front door. Izzy looks a little listless and tired, as Karl comments when he comes in. She says she's Ok but maybe she needs some food. Karl offers to cook for her, but she looks queasy and says she's not really up to it. She and Karl are smiling and very close to one another when Libby comes in carrying Ben and just glares at them disgustedly before going out again. Connor asks Lori about her going away. She feels it's not as far as New Zealand and it will give Jack a chance to cool off and she's hoping that he'll decide to look after Joe's business and do TAFE. Connor says he'll miss both her and Maddie, so Lori gives him ‘some quality time' with the baby and looks on smiling as he ‘teaches Maddie to play pool'. Jack is answering Lyn in very peeved tones so she forces him to talk to her. They have a heated exchange where he complains that his own mother told the girl he loves she's too good for him. She tells him she looked after Lori, because her own parents are in New Zealand – it's about building Lori's strength and that's the priority, not his heart or guilt He yells back that she's wrecking everything, while he has to look after Joe's business and deal with all her stuff, but she still thinks no good of him and he can't figure why. She just looks dumb founded as he storms off. Max tells Summer she's going to New Guinea and quietens Boyd's protests that it's not fair. When Summer's gone to pack, Max tells Izzy and Boyd that Gus has a key and has been in the house, impersonating him. Izzy asks if he thinks Gus is dangerous. He doesn't reply directly, just says that he's not taking any risks and they are to stay together and stay put. He's not going to the police yet, but wants to go to where Gus stayed at the pub, so he can see if he can find clues to work out Gus's thinking. Izzy says she's really scared, but Max reassures her that with the new locks, Gus can't possibly get in. There's a shot of the spot where ‘Steph's keys' had been on the shelf, now empty and then a view of a key in a key-cutting machine. A man takes the key out and hands it to Gus who holds it up with a smug smile. Susan comes in and comments on something smelling good, then excitedly greets Libby and hugs her. They chat about the job and why Libby has left it and the journey over. Connor suggests Max should go to the police, but he feels he can't just go and tell them someone signed him up to cable. He tells Connor that he mainly thinks that Gus just wanted to be him, or at least a member of the family. Connor finds a photo, which Max recognises as the one that went missing when they had the Home Open. They agree that that gives them something that can go to the police. Libby and Susan do some more chatting to catch up, then Libby tells Susan that she went to see her father, but ‘Jezebel' was with him so she didn't stop and bought cakes at a different shop instead. 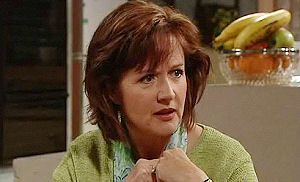 Susan tells her that she could have just said ‘Hi dad' but Libby changes the subject to say that they should clean out Billy's old room for Ben. Susan just tells her that she doesn't know about their guests – they're very entertaining. Max tells Izzy and Boyd that gus had the photo. They're both freaked out and just as he starts to tell them what the police said, he cuts it short when Summer comes into the room. Max doesn't want to tell her as it's too creepy. He won't let her go out to see Lyn and Oscar and once she's been sent to bed he sets rules – nobody home alone, all doors and windows locked at all times – non-negotiable. Susan's trying to persuade Libby that she should try to meet and take an interest in men and they go on to discuss Susan's recent social life and more importantly her attempt to pick up a priest – and not just any priest, but Lyn's brother. Connor' s walking Maddie and sits with her on a bench, where he tells her that she's going away, but he will look after her. He says she coughs and pukes and cries but he still loves her. She just gurgles happily. Max, Boyd and Izzy say goodbye to Summer. Max tells Boyd to stay put while they're going to the airport, to which Boyd replies that he's a prisoner in his own home, but at least it means he might miss double Maths. That changes Max's mind and he tells Boyd to come with them so he can be dropped off at school on the way.Shadow whimpers and ‘begs', so Max picks her up, tells her to stop whimpering and be ready to go back to Lou. We see as he leaves that an envelope marked ‘Steph's keys' has been left on the shelf. Jack begs Lori to stay or let him come with her, but she's adamant that Lyn's right and they should wait a while. He isn't persuaded, but she says that he and his mother have made her feel strong again and they can wait a few months to find out. He's bitter that Lyn was there to tell her to run as fast as she could away from him, but Lori wants him to make up with his mother and be happy for her. Shadow sneaks under the gate and races off to where Gus is hiding behind a fence. He opens the gate and picks her up, saying she's blown his cover'. Across the street he sees Connor, Jack and Lyn saying goodbye to Lori as she gets into a taxi. Connor says goodbye to Maddie and Jack isn't too happy as Lori hugs Connor. He and Lori hug and kiss and she reassures him that everything will work out OK. The three watch as the taxi drives away. Jack has to go to work, so refuses Lyn's offer of coffee and cake and Connor just looks a little down and also refuses her. She rubs his shoulder comfortingly and goes back to the house as he just stands there, looking thoughtfully down the street. Gus is lurking in the bushes and watching some young people some distance away. He holds up Shadow, tells her to just go and act 'cute' then sets her down so that she can race off to the girls sitting on the grass. he smiles as a girl pats her and walks away. Izzy arrives with an Avengers video and is startled to see that Karl has prepared a meal with candles, wine and mood music. She tells him that she came for beer and pizza and to take her mind off things, not to be seduced. His response is that he's happy with just friends, but she thinks he wouldn't go to that much trouble for that. She says firmly that what he wants isn't going to happen because she doesn't feel about him what he feels for her. A bit nonplussed by that, he explains that he doesn't understand, as she seems to be at least a little attracted to him. She asks him why he wants her and he goes into detail about how wonderful she is. She loves life and has so many qualities, so many men would want to be with her – and he'd love to be with her. She seems upset as she tells him to give up this fantasy and hesitates before adding that ‘Basically, you're just too old for me'. He looks very serious. Izzy insistently refuses to listen to Max's concern about leaving her alone in the house and makes him go to work and leave her to enjoy some time off from everything. 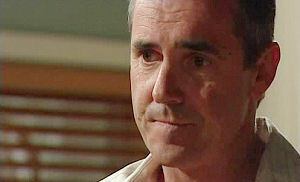 As soon as he and Boyd leave, she takes a pregnancy test indicator from her pocket, looks down at it and begins to cry. Just as we hear Max's car start and drive away, Gus comes quietly through the side gate into the Hoylands' garden and slinks along the back of the house to peer through the window. Inside, Izzy is really crying now, holding the test indicator, which is ‘positive'.